This month, Bollyshake and EROS are teaming up to give dancers a chance to meet the starcast of the newest Sanjay Bhansali film, Bajirao Mastani. Fortunately, Desi Dance Network has been invited to be part of the party now! We will be interviewing and showcasing some of the incredible talent in our circuit. We had the privilege of interviewing Neelam Patel for our first Bajirao Mastani Spotlight. Neelam Patel, an alumna of North Carolina State University, has been dancing for 17 years! After 8 years of Bharatanatyam, she completed her Arangetram at 13 years old. Although formally trained in Ballet, Jazz, Modern, Bharatanatyam, and Hip Hop, Neelam has also competed in Bollywood and Garba/Raas competitions while growing up. After high school, she extended her training in Modern and joined two dance companies along the way. 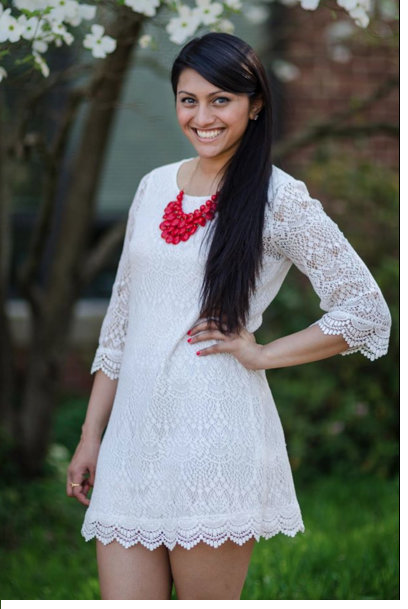 During her time at NCSU, Neelam learned Bhangra and joined Wolfpack/NC State Bhangra for a year before she Co-founded and Co-captained NCSU Nazaare with Meera Patel. Which team(s) were you on? What are your current involvements with dance now that you are no longer dancing on NCSU Nazaare? I currently teach private lessons/choreography through my site Bollywood Empire, and recently joined Aatma Performing Arts but was not able to tour/dance with them cause unfortunately life kicked in... the usual. Which styles do you wish you can do more? I always wished that I had more training in acro(i know this isn't a dance style per say, but still)/hip-hop and ballroom/latin. My favorite thing about dancing is actually the variety of movement in different styles. Being trained in multiple styles, I love bouncing from one to another and training my body to be able to do so. My favorite aspect of Bollywood is the literal expressivness through emotions/gestures. Most styles express solely through movement. What's the inspiration behind your Bajirao piece--if anything? Is there a story behind it? The inspiration for me was the honesty and genuine touch of the vocals in the song. Its truly a beautiful composition that can arise a multitude of emotions in just about anyone who listens to it. Are there any other interesting thing you would like to add about yourself, future career, etc.? Just a little about me! I recently graduated with a B.S. in Biology from NCSU and juuuust turned 22. I currently work as a Southern Territory Manager for a small small company based out of West Chester called Diapharma and cover 13 states (I travel quite a bit). On the side of working I enjoy baking, spending time with friends and family, continuing to dance/choreo/take part in small competitions (such as this one ), and travel/vacation of course! In the past 3 months I've been to 2 countries, 7 States and 14 cities (aka I'm never home). If you enjoyed her performance, make sure to vote for her on Bollyshake by visiting this link and clicking the Thumbs Up! If you would like to enter the competition, please check below for details! Bollyshake has some special prizes exclusively for DDN. The Top 5 videos with the most likes on Bollyshake will receive free movie tickets to #BajiraoMastani opening weekend (2 tickets for every dancer in your video). To make the deal even sweeter, any DDN video that drives over 100 likes will be given an additional award! (shh...it's a secret, so stay tuned) This is the cherry on top of what's already being offered! You have the flexibility to submit something for Deepika's #DeewaniMastani (now) or Priyanka's #Pinga (November) or both if you feel up to the challenge! We're calling on all dancers to look out for the hottest dance songs of the year and to submit their renditions with the hashtag #BajiraoMastani. Deepika and Priyanka will select their favorites to compete to win the ultimate experience you don't want to miss. The overall winner will also receive a trip to meet the starcast of Bajirao Mastani in Mumbai! Other DDN Submissions To Check Out!